Are you tired of getting invited to parties for Epicure, Amway, Norwex, etc.? Do you feel obligated to go to them because you know the host; and then you feel obligated to buy some overpriced junk because, well, that’s the whole point of the party? Yes, now you can guilt your friends and family into attending one of your parties. The City of Winnipeg makes it easy for you, with training sessions about hosting budget parties and their downloadable Host Your Own Budget Talks Kit. 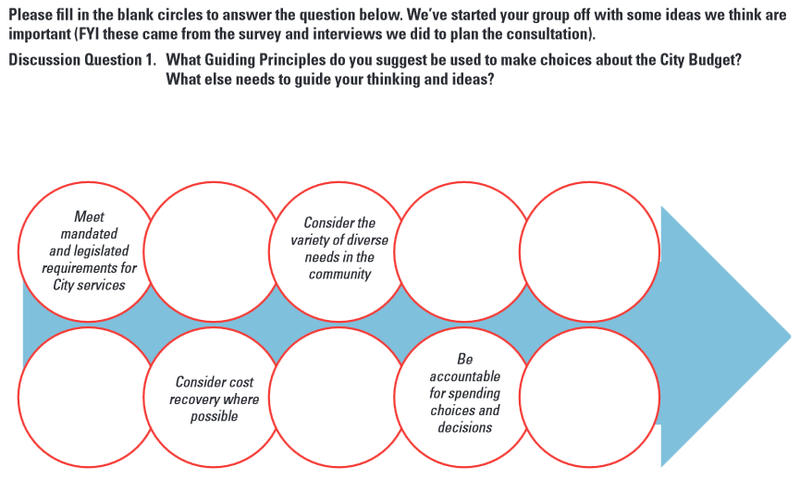 The kit contains step by step instructions and handy check lists to ensure that you and your victims are prepared and organized for an evening of stimulating discussion on how the city can move forward in a fiscally responsible manner. You and your friends can hash out the solutions to the city’s budget woes over a plate of dainties, and relay these ideas to the City by filling in squares and circles in the budget discussion guide. This is part of a souped-up new consultation process for the 2015 budget that began back in March, possibly spurred by criticism of poor consultation about previous budgets. The first stage, already completed, involved asking people how to most effectively engage them in the process. Those results were compiled in a document that includes some of the specific feedback from participants. Ask not what your city can do for you …. Also suggested was clear and easy-to-understand information about revenues and expenses, which I presume resulted in the Budget Fact Booklet which contains charts and graphs summarizing the financial particulars of the city. I quite like this virtual booklet, but one big criticism I have is the nonsensical categorization of expenses. 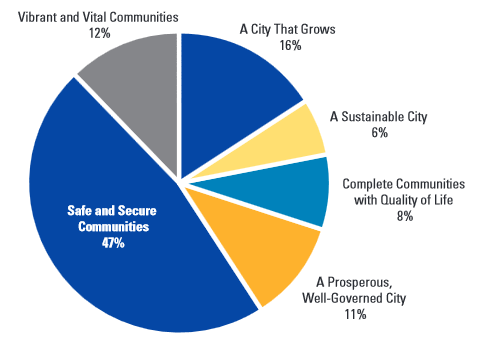 “A City That Grows”, “Vibrant and Vital Communities” and “A Prosperous Well-Governed City” aren’t income statement categories — they’re wish lists. Why not call them what they are: Infrastructure & Maintenance, Recreation Services, and Administration? I joke about punishing your friends and family by inviting them to a budget consultation party, but to be serious, it is kind of nice to see the City reaching out like this. They are obviously putting a lot of effort into making materials and resources available for people to provide input in the budget. I also wonder about the real effect of a process like this. Will the gathered input actually have an impact on the budget? Should it? Should the city even take into consideration conflicting input from a relatively tiny sample of citizens when they have their own experts to rely on? What if 10% of the respondents insist that a laser pyramid is a top priority for the city? Then what? However, by far my biggest concern is with general decision-making at city hall. A budget consultation almost seems meaningless when we’ve so recently seen millions wasted on poorly managed construction projects, fighting and waffling about the rapid transit expansion, and unconstrained residential sprawl, among other things. The consultation process implies much more orderly decision making at city hall than what we actually witness in real life. Don’t let that stop you from having a budget party though. I might even come, but only if there are snacks.